Click below to access resources from our four Communities of Practice! 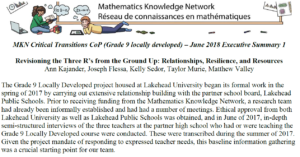 December Update from the Mathematics Leadership CoP (December 2018). 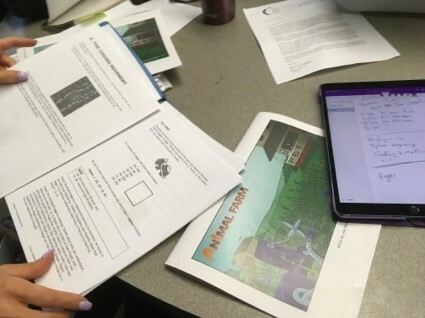 Read about the three events in which our partners and members participated since the start of the new school year: OAME Leadership Conference, JUMP Math and Western University Conference, and Ministry of Education professional learning virtual meetings! 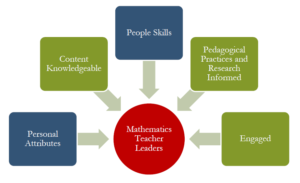 Content Leadership in Mathematics Education (November 2018). Read the new Literature Review and Recommendations prepared by our Mathematics Leadership CoP research team. Learn about recommendations for teacher leadership, school-based leadership, professional development, and more! GECDSB’s Mathematics Leadership Learning Project (MLLP) (August 2018). For the project overview, results, and implications for future learning, check out the report by our Mathematics Leadership CoP & GECDSB. The Math Pod Cycle 3 Overview (May 2018). Cycle 3 of The Math Pod occurred from April 4-25, 2018. Check out the highlights from Cycle 3 in this report by our Mathematics Leadership CoP! The Math Pod Cycle 2 Overview (April 2018). 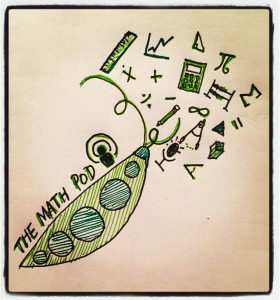 Cycle 2 of The Math Pod occurred from January 17 – February 7, 2018. Check out the highlights from Cycle 2 in this report by our Mathematics Leadership Community of Practice! Spiralling the Mathematics Curriculum within a Research-Supported PLC: A K-12 Perspective (January 2018). 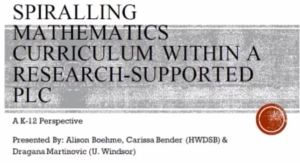 Watch the presentation by Alison Boehme, Carissa Bender (HWDSB), & Dragana Martinovic (University of Windsor) from the Fields MathEd Research Day. The Math Pod Phase 1 Overview (December 2017). 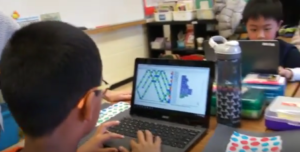 Learn about the success of the first phase of this collaborative open learning opportunity in their Phase 1 Report (prepared by Dr. Dragana Martinovic and Debbie Donsky for our Math Leadership CoP). 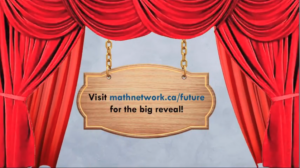 Visit themathpod.ca to learn more, and join them for phase 2 from January 17 – February 7! 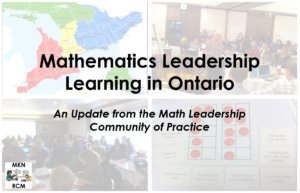 Mathematics Leadership Learning in Ontario (December 2017). 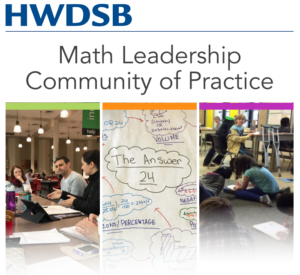 See the blog post by Dr. Dragana Martinovic to learn about the latest updates from the Math Leadership CoP. Leadership systémique (November 2017). 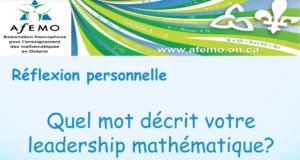 Check out our resources developed by AFEMO for system leaders (available in French only). Mathematics Educator Leadership in Ontario: Research Results (September 2017). See the research report by Dragana Martinovic on behalf of the ML CoP. Moderating Mathematics: A School-based Professional Learning Model (September 2017). See the protocol developed by the Program Office of the GECDSB for the ML CoP. Professional Learning Facilitators’ Guide (September 2017). See the guide prepared by the GECDSB team for the ML CoP. Eastwood Whole School Inquiry on Concreteness Fading (August 2017). See the case study report prepared by Dragana Martinovic and Heidi Horn-Olivito. Literature Review on Content Leadership in Mathematics (August 2017). Compiled by the Math Leadership Research Team! Get the PDF here. Recommendations from a Research Summary (August 2017). Prepared by the Math Leadership CoP. See the recommendations here. Canada 150 Math Challenge Report (GECDSB) (August 2017). See the report prepared by our Math Leadership CoP to learn about math tasks and results of the whole school inquiry. Strengthening the Mathematics Curriculum: An HWDSB Research-Supported Professional Learning Community (July 2017). See the 2-page summary by Alison Boehme, Grade 5 teacher at Cootes Paradise Elementary. Supporting All Mathematics Learners through Responsive Learning Environments. Research Reports: Easy Access, Efficient Utilization. 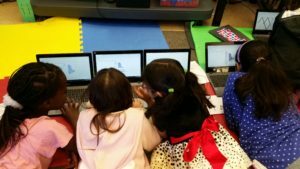 Cast a Wide Net at St Andrews PS, TDSB: AI, robotics, coding, math, social studies (December 2018). Students are about to embark on a journey that will take in literature, communication, mathematics, coding, engineering, making, and most importantly – thinking. Read the report by Iain Brodie to learn what the grade sevens at St. Andrews Public School are about to do with artificial intelligence. 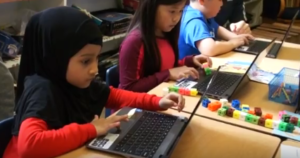 Modelling Civilization at St Andrews PS, TDSB: Coding, Making, Math (December 2018). Even our youngest students are capable of incredible feats of thinking and learning. Read the report by Iain Brodie to see how grade 3 students model their own civilizations in the classroom. Computational Thinking in Tertiary Mathematics Education (October 2018). How does computational thinking affect students’ understanding and experiences in tertiary mathematics? 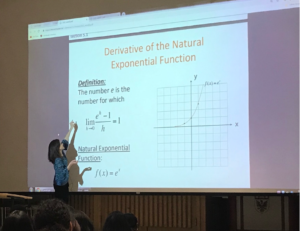 Read the report by Erin Clements (McMaster University) to see how coding was integrated into an applied calculus course. 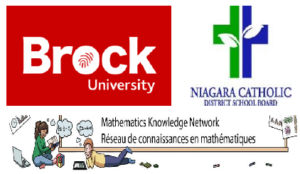 Brock U-NCDSB CT + Math Tasks (October 2018). 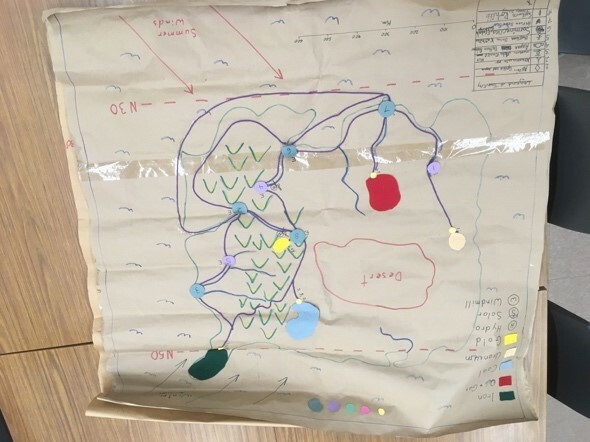 Brock University students worked collaboratively with Niagara Catholic District School Board teachers to develop engaging, coding-based activities for students that were explicitly or implicitly about mathematics. Explore their 4 CT-based math task summaries here. Math, art, code (September 2018). This page includes web links for math + code + art, as well as annotated bibliographies on math + story/poem, math + dance/music, and math + arts theory. Brock U-Niagara Catholic DSB Computational Thinking Initiative (May 2018). 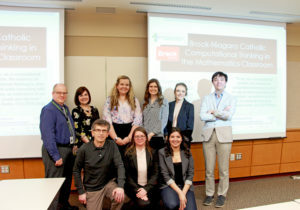 With a focus on experiential learning, five Brock University students worked collaboratively with Niagara Catholic District School Board teachers to develop engaging, coding-based activities for students that were explicitly or implicitly about mathematics. Read the News Article from Brock University. 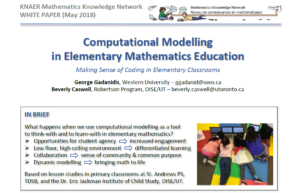 Computational Modelling in Elementary Mathematics Education – Making Sense of Coding in Elementary Classrooms (May 2018). Read the White Paper by CT CoP members, George Gadanidis (Western University) and Beverly Caswell (Robertson Program, OISE/UT). Integrated Mathematics + Computer Science – Grade 10: Reforming Secondary School Mathematics Education (April 2018). Read the White Paper by CT CoP members, George Gadanidis (Western University) and Jeff Cummings (Wellington Catholic DSB). Coding for all: A story of purpose (December 2017). 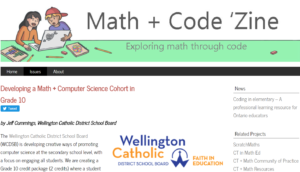 Read the newsletter from the Wellington Catholic DSB to learn about their innovative math + coding projects. Back to the Future – Hour of Math + Code (December 2017). 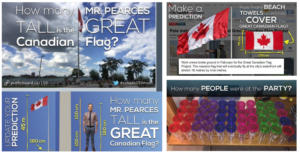 Try out our classroom-tested activities and challenges here. Wellington CDSB Innovation Project in Math + Coding (November 2017). Offering a course where students learn Grade 10 math but also apply knowledge using Coding environments. Check out the video overview! CT CoP Overview (October 2017). 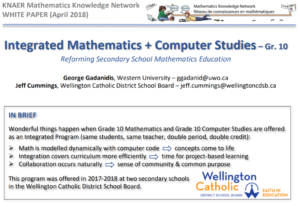 See the slides by George Gadanidis (Western University) and Jeff Cummings (Wellington CDSB) for an overview of Year 1, and plans for Year 2! Wellington Catholic DSB 2016-2017 Project Overview (October 2017). See the coding documentary here! See the blog post by Jeff Cummings for more details. Literature Review on Computational Thinking and Mathematics (June 2017). See the current draft by Rosa Cendros, PhD candidate at Western University. Repeating Patterns + Coding lesson study documentaries (June 2017). See the lesson study documentaries for Grades 1/2 and Grades 2/3. Updated Math + Coding documentary on symmetry as a transformation (June 2017). See the documentary for Grades 2/3. 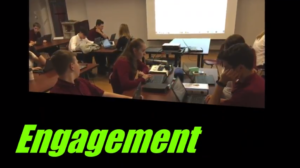 Wellington Catholic DSB: Developing a Math + Computer Science Cohort in Grade 10 (May 2017). See the article. Computational Thinking in Mathematics Education. Researching the use of computational thinking in mathematics education, from pre-school to undergraduate mathematics, and in mathematics teacher education. Math + Code ‘Zine. We love math. We love coding. And we love the power of the two combined! Crossing the Divide: Critical Transitions in Student Mathematical Development Gr 8-9 (September 2018). Visit the new website mkncrossingthedivide.ca to learn about Gr 8-9 Transition Support Strategies, Math Myths Debunked, Online Resources and Supports, and more! Early Childhood Educators’ and Teachers’ Early Math Education Knowledge, Beliefs, and Pedagogy (September 2018). The results of our Critical Transitions Kindergarten Educator survey are now available. Please share our summary infographic widely! The full paper will be available in December 2018. Revisioning the Three R’s from the Ground Up: Relationships, Resilience, and Resources (June 2018). 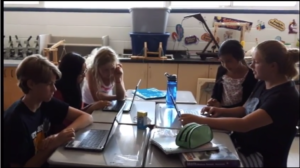 Read the Technical Report and Executive Summary to learn about the work happening in Locally Developed Grade 9 classrooms through our Critical Transitions CoP. Teach the Mathematics of Mathematicians (April 2018). New journal article by Dr. Peter Taylor (Professor at Queen’s University, member of Critical Transitions CoP) in Education Sciences. Read the paper here. Workshop on Crossing the Divide: Exploring Critical Transition Issues from Grade 8-9 Mathematics (March 2018). 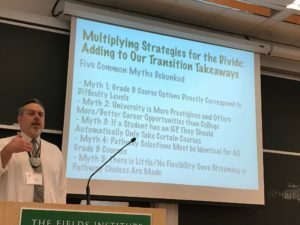 Held at the Fields Institute; Lead by Dr. Daniel Jarvis, Critical Transitions CoP member and Professor at the Schulich School of Education, Nipissing University. Further details, slides, and presentation recordings available here. Critical Transitions CoP Year 1 Overview (October 2017). See the slides by Dr. Sandy Youmans (Queen’s University) for a full overview of this CoP’s 2016-2017 activities! Mathematicians in the Crib (August 2017). Presentation by Dr. Jean Clinton (McMaster University) at the Critical Transitions CoP’s Kindergarten Forum for Action. Watch the video, find related resources, and share your thoughts! 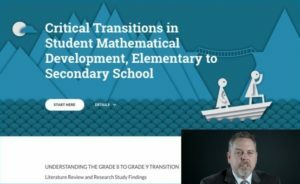 Critical Transitions in Student Mathematical Development, Elementary to Secondary School: Literature Review and Research Study Findings (August 2017). See the report by Daniel Jarvis and Tiberiu Veres. 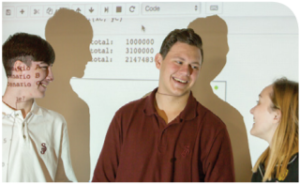 Math9-12 Project Website (2017). A research-based study designed to bring new life to the high school math curriculum, lead by Dr. Peter Taylor (Queen’s University). Find and try out their resources on the Math9-12 project website! Choose a Path that Includes Math! Get to know their online toolkit for Ontario teens and parents who are exploring choices for high school math courses. Visit them at mathpathontario.ca/home.php and check out the video overview. Mathematics Learning Trajectories. See the 5-minute video clip with slides by Dr. Douglas Clements, who explains the power and research base of his and Dr. Julie Sarama’s learning trajectories and their new free math web tool (birth to age 8) for educators, parents, curriculum developers, and PD facilitators. IK CoP Video Series (September 2018). 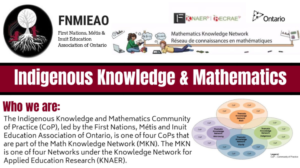 The IK CoP released a series of videos that highlight the significance of Indigenous Knowledge in mathematics, provide several examples of Anishinaabe educators, and demonstrate how land-based learning and language help develop spatial reasoning skills. Please share the Flyer widely, and watch the videos at bit.ly/IKMATHvideos. IK CoP Overview Flyer (September 2018). Looking for a quick overview of the Indigenous Knowledge CoP? Check out their Flyer for who they are, why they exist, and their goals. Please share widely! 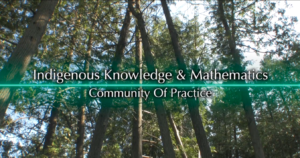 Indigenous Knowledge CoP Video Trailer (February 2018). IK CoP plans to further knowledge mobilization by developing a series of videos that showcase their work. See the trailer on TeachOntario! To access our general MKN resources, click below. 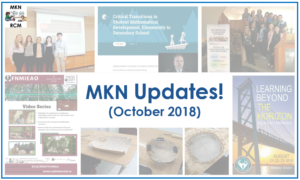 MKN Updates (October 2018). Read our latest updates to find out what our CoPs have been up to over the summer, explore recently added resources, & learn how you can get involved. MKN Updates (July 2018). Updates from the MKN and our Communities of Practice are featured in the 4th Issue of the KNAERative Quarterly Newsletter. Read the latest news here. MKN Updates (April 2018). Updates from our CoPs are included in Issue 3 of the KNAERative. Check it out here. MKN Updates (January 2018). Updates from our CoPs are included in Issue 2 of the KNAERative. Check it out here. MKN Updates (November 2017). 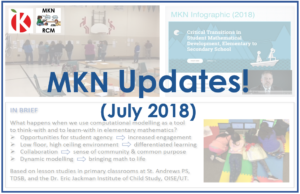 Learn about MKN updates in this 2-page summary. MKN Updates (June 2017). 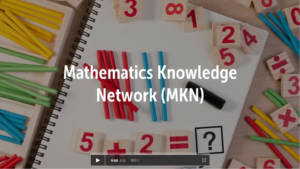 Learn about MKN updates in this 2-page summary. MKN Overview Flyer (May 2017). 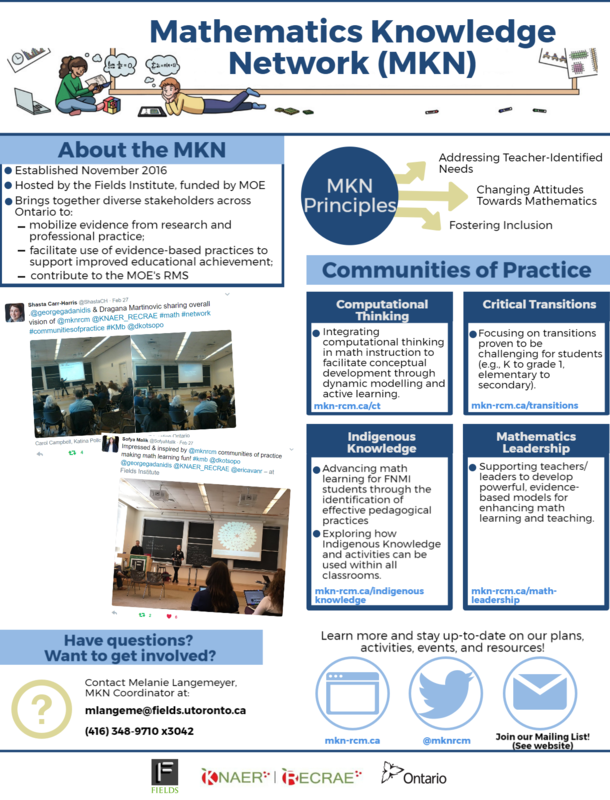 Check out this 1-page overview of the MKN. Want to stay updated? Join our mailing list (right side of page) and/or follow us on Twitter @mknrcm to receive regular updates about new resources, activities, and more!